Young Girl Leaning on Her Elbows in front of Flowered Screen, 1923. Crayon lithograph with scraping. Image: 7 3/16 x 10 5/16 in. Sheet: 11 3/8 x 14 1/4 in. Pierre and Tana Matisse Foundation (1732 – 109020)© 2013 Succession H. Matisse/Artists Rights Society (ARS), New York. Courtesy American Federation of Arts. 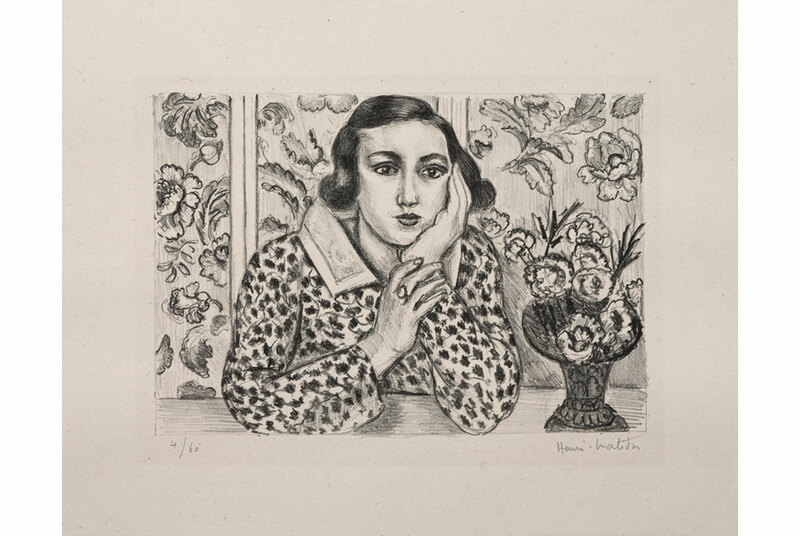 Matisse as Printmaker: Works from the Pierre and Tana Matisse Foundation opened April 6, 2014 at the Memorial Art Gallery and remains on view through June 8. Drawn from the extraordinary collection of Matisse prints that once belonged to the artist’s son Pierre, the exhibition includes 63 etchings, monotypes, aquatints, lithographs, black and white linocuts, and two-color prints—examples of every printmaking medium used by Matisse. With its rich variety of media and subject matter, Matisse as Printmaker sheds new light on an under-studied aspect of Matisse’s oeuvre and underscores the importance of printmaking for the artist.